The deal, designed to drain record global oil inventories, overcame disagreements between the group’s three largest producers -- Saudi Arabia, Iran and Iraq -- and ended a flirtation with free markets that started in 2014. It was also broader than many had expected, extending beyond OPEC. Most strikingly, Russia agreed to unprecedented cuts to its own output. The impact on the energy world was immediate: benchmark oil prices gained as much as 10 percent in New York and the share prices of energy companies around the globe jumped alongside the currencies of large exporters. Whether that’s sustained will depend on how strictly members of the Organization of Petroleum Exporting Countries stick to the agreement, something they haven’t always done in the past. OPEC will reduce output by about 1.2 million barrels a day by January, the group said, fulfilling a plan sketched out in Algiers in September to cut its production to 32.5 million barrels. The agreement exempted Nigeria and Libya, but gave Iraq its first quotas since the 1990s. West Texas Intermediate crude futures rose 0.3 percent to $49.61 a barrel at 11:44 a.m. Singapore time after gaining 9.3 percent Wednesday, the biggest one-day gain since Feb. 12. After weeks of often tense negotiations, the eventual alignment of OPEC’s biggest producers points to the increasing dominance of Iran among the group’s top ranks. It’s allowed to raise output to about 3.8 million barrels a day, a victory for a country that’s long sought special treatment as it recovers from sanctions. Saudi Arabia previously proposed that its regional rival limit output to 3.707 million barrels a day, delegates said. The economics of the deal are “incredibly appealing,” Jeff Currie, global head of commodities research at Goldman Sachs Group Inc., said in an interview with Bloomberg Television. The main aim of the cuts is “inventory normalization,” he said. 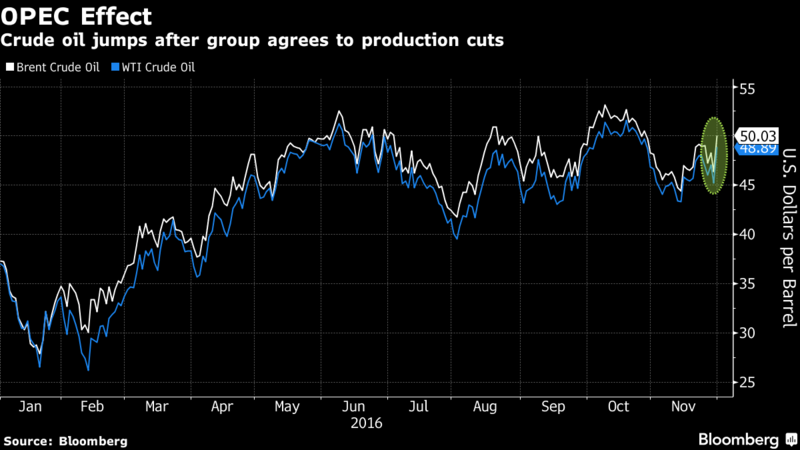 Across the U.S. shale patch, the OPEC cut triggered a huge equity rally. Whiting Petroleum Corp. rose as much as 32 percent -- its biggest one-day jump in 13 years -- while Continental Resources Inc., the company founded by Donald Trump’s adviser Harold Hamm, gained as much as 25 percent, the most since 2008. Saudi Arabia, which raised oil production to a record this year, will reduce output by 486,000 barrels a day to 10.058 million a day, an OPEC document shows. Iraq, OPEC’s second-largest producer, agreed to cut by 210,000 barrels a day from October levels. The country had previously pushed for special consideration, citing the urgency of its offensive against Islamic State. The United Arab Emirates and Kuwait will reduce output by 139,000 barrels a day and 131,000 a day, respectively, the document shows. Non-member Russia, also pumping at a post-Soviet record, will cut by as much as 300,000 barrels a day “conditional on its technical abilities,” Energy Minister Alexander Novak said in Moscow. Russia, the biggest producer outside the bloc, had previously resisted calls to trim its production, insisting it would only consider a freeze. OPEC plans to hold talks with non-0PEC producers next week in Doha. The strength of the deal will depend on whether all parties deliver on their commitment. Saudi Arabia and its Gulf allies, the U.A.E. and Kuwait, have traditionally stuck to their cuts, but some others haven’t, particularly when prices are low. Any doubt in the market could once again see prices come under pressure. The last two years have been painful for OPEC: The group will earn $341 billion from oil exports this year, according to the U.S. Energy Information Administration. That’s down from $753 billion in 2014 before prices crashed, and a record $920 billion in 2012. The group will meet again on May 25 next year, at which point it intends to extend the cuts by another six months, Qatari Energy Minister Mohammed Al Sada told reporters in Vienna. Indonesia requested a freeze of its OPEC membership. Its suspension won’t affect the size of the group’s production cut, one delegate said.